Combes, Richard E. “McCraw on the Nature of Epistemic Trust.” Social Epistemology Review and Reply Collective 4, no. 8 (2015): 76-78. (4), Jones has confidence in Smith’s credentials to avow that p.
In the following remarks I don’t so much question the legitimacy of these criteria as call attention to the essential function performed by propositional attitudes of belief in epistemic trust. This role deserves a pride of place that McCraw seems to dispute. Placing trust in someone is dependent upon the conviction that certain claims are true. It is on this issue of whether trust in collapses into belief that where our disagreement lies. Trust simpliciter is faith in someone’s linguistic or non-linguistic behavior and requires a truster, a trustee, as well as an object entrusted. The latter relatum is most clearly conceived to be a proposition. To take McCraw’s example on page 3, the “thing” entrusted is not literally the getting of milk—admittedly a common way of speaking—but rather the belief that my wife will indeed pick up milk at the store. To generalize from such ordinary cases of trust, as they exist interpersonally (e.g., between spouses) or in relationships involving individuals and institutions (e.g., between citizens and government), what’s entrusted are specific judgments (e.g., “She will remain committed to me until death do us part” or “Since its representatives promised, Congress will not call for new taxes”). Self-reflection confirms that one cannot simply will oneself to trust another (or oneself, in cases of self-trust) in a vacuum. Given that trust does not magically appear ex nihilo, the question naturally arises, how then is it acquired? Trust is generated only if the truster believes that the trustee’s prior track record supports confidence in the trustee’s present and future testimony (whether implied or overtly stated). One’s acceptance of another’s integrity as a beacon of virtue or as a source of knowledge demands antecedent confirmation. Of course it should be acknowledged that trust comes in degrees, from the provisional assurance I may have in the pronouncements of elected politicians to the maximal moral certainty I may have in the declarations of my soul-mate. A continuum undeniably exists whereby we trust some persons more tentatively than others, some with hesitation and others without. Regardless of whether my background knowledge concerning the trusting situation at hand is extensive or not, I must be prepared to convince at least myself that I have a modicum of justification to be guided by the trustee in question. I as the truster must believe that the trustee is minimally reliable before I decide with whatever level of confidence I possess that what the trustee affirms is true. It is precisely in the absence of any such evidence that trust is misplaced. To the extent that we are rational, we lose trust in people when it comes to light that either the trustee deceived us as to his or her bona fides or we ourselves have been guilty of inflating the epistemic value of his or her previous testimony. McCraw denies that all instances of trust presuppose a positive assessment of the trustee’s qualifications. Citing children, he claims that trust may be “unreflective or pre-critical” (7). I realize that many exhibit sincere trust without being consciously aware of doing so. Indeed, I can even think of certain individuals who seem outwardly to assume an untrusting attitude and yet display persisting trusting patterns of behavior that belie their public posturing. A colleague may rail against the once popular but now discredited university administration while at the same time and with a steady predictableness embrace its policies as tried-and-true. All the same, I would insist that if the supposed truster cannot upon being questioned (or undergoing psychotherapy) acknowledge evidence, at least to oneself, that the trustee’s present or future testimony is credible in light of past achievement, the trust is only apparent and not real. Individuals may not be continually entertaining at a conscious level their reasons for placing trust in others, but they at least must be disposed to articulate them when suitably prompted. McCraw himself seems to concede this point in his appreciation that confidence has a cognitive dimension (16). Trust-like behavior will not by itself establish the presence of the genuine article. An infant or a companion animal may simulate the movements symptomatic of trust, but unless each is cognizant of the caregiver’s past successes at meeting its needs and wants, the activity observed reflects only the living creature’s present desires and nothing as intellectually sophisticated as actual trust. Even when psychologically developed individuals interact in a trust-like manner, as in the case where I ask a stranger for directions and proceed as if they are accurate, it does not automatically follow that trust emerges. While I may have no reason to doubt the stranger, I still remain ignorant of potential evidence to serve as a foundation for feeling any epistemic loyalty towards that individual. McCraw is therefore mistaken to consider such a dependency relation an instance of trust (3). Reliance and confidence are not classified by McCraw as distinctly epistemological components of epistemic trust. Yet does not my belief that the testimonials of some trustee S are by and large true ground my confidence in S, which in turn justifies my reliance on S? Certainly having trust in S that p is a different attitude from merely believing that p, but trust exists only should one be convinced that S’s prior track record warrants endorsement of S’s present or future proclamations. Possibly the antiseptic and unromantic tone is found unsettling, but why does a “well evidenced wager” (15) that my wife will remain faithful given her past actions not embody trust? Perceived competence in S’s purported domain of expertise begets confidence, not the other way around, as McCraw seems to maintain: “If I am confident in Jones to [x], then I have taken it for granted that Jones is competent with respect to [x]ing” (7, my emphasis). Attributions of fidelity must be deserved. Perhaps the truster is being artfully betrayed or prone to wishful thinking. Nevertheless, he or she has to interpret at least some of the trustee’s intentional behavior as support for the trust expressed. As revealed by the introspective evidence, totally blind trust is simply not possible. I conclude that epistemic trust is parasitic on believing that. Using McCraw’s terminology, I favor an “overly thin” analysis of epistemic trust. Belief that S’s prior track record supports confidence in S’s present and future testimony just is trust. It is inconceivable to believe that S’s prior track record supports confidence in S’s present and future testimony and not trust S. This may be granted, with the proviso that an irreducibly distinct attitude of trust supervenes on the belief that S’s prior track record supports confidence in S’s present and future testimony. However I, for one, am unable to identify such an episodic mental state. Phenomenologically, trust is not presented to consciousness as an occurrent raw feel, as pain or phenomenal red is. My faith in S is reducible to my judgment that S’s claims have been true and will continue to be so. 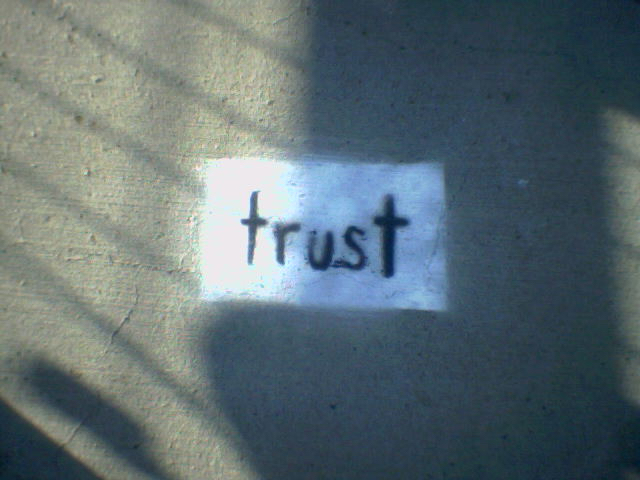 Epistemic trust—and moral trust for that matter, which is none other than a species of epistemic trust—should thus be conceptualized as the disposition to accept another’s testimony (implicitly or explicitly announced) and behave accordingly because of beliefs concerning that person’s alleged past success at tracking what is taken to be the truth. It seems though there might be a case for not making dispositions to trust reduce to evaluations of competence in term so if a value it might have in psychological explanations? For example, will children will trust the testimonies of their parents without an assessment of their epistemic competence – something that inevitably kicks in at adolescence. There might also be an advantage to avoiding reduction as it would enable an analysis of the kind of “attentional doxastic voluntarism” that Mark Douglas West explores (Collective Vision page14 April 2014), where in his AA example, AA participants might be expected to extend trust in spite of their assessments of the competence of others. Potentially, the advantage of keeping trust a bit conceptually distinct is that it might help with sociological explanations as how less than ideal agents stay locked in a particular doxa. So there are some thoughts. (I appointed myself the role of compulsory comment bot last Friday).